This section contains information related to Monarch, flight code ZB, a low-cost carrier charter type. 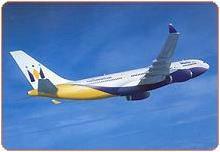 "Probably the best-known part of the Monarch group is Monarch Airlines - with its fleet of 21 modern aircraft. The company has two divisions: first, Monarch - the largest independent charter airline in the UK, second, Monarch Scheduled - providing low cost, convenient flights that members of the public can book direct. Monarch is all about giving quality, value and choice - the hallmarks of the Monarch group. Together, the two divisions of Monarch Airlines carry around five million passengers to nearly 100 leading destinations every year. The scheduled part of Monarch started operations in 1986. " Monarch Airlines Limited is member of 'The Airline Group'. Click to browse to the network development section of this site, featuring more more information on the network development of Monarch Airlines.